View basket “Excalibur Cement Spatula (Figure 4)” has been added to your basket. Figure 3 – Double-ended cement spatula, made from quality German Stainless Steel with rounded hollow ergonomic handles. Each pack contains 1 piece. Figure 4 – Double-ended cement spatula, made from quality German Stainless Steel with rounded hollow ergonomic handles. Metal 8x – Alginate/plaster mixing spatula metal 8X with curved tip and wooden handle used for mixing Alginate and Plaster. 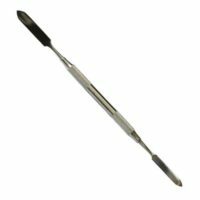 Kemdent plaster and alginate mixing spatulas are available in a variety of shapes and sizes to cater for various tasks. Plastic Alginate Spatula with Grooved handle for easy mixing. 2.5mm wide Head – Excellent quality Heidemann Spatula, made from quality German Stainless Steel with rounded hollow ergonomic handles. 3.0mm wide Head – Excellent quality Heidemann Spatula, made from quality German Stainless Steel with rounded hollow ergonomic handles.